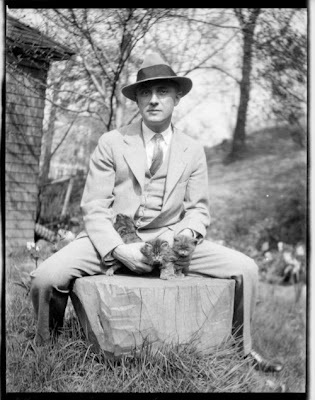 William Carlos Williams, as proper as always, holding a couple of kitties..
William Carlos Williams was born on September 17, 1883, in Rutherford, New Jersey. Williams graduated from the University of Pennsylvania Medical School and worked for many years as a physician in Rutherford. He was familiar with Ezra Pound and the work of T.S. Eliot, but came to dislike both. In addition to his own poetry (collected in two volumes by New Directions) and the long poem, Patterson (also available from New Directions), Williams wrote an autobiography, short stories, novels and plays. He was a mentor to Charles Olson, and a hero to poets like Allen Ginsburg. Several of Ginsburg's letters to Williams are included in the text of Patterson. Williams died on March 4, 1963.